Training Camp Question #10: What Are the Big Battles? Leading up to today’s start of Bills Training Camp, Buffalo Sports Page will ask and answer the ten biggest questions facing the team in 2018. Today, at St. John Fisher College, the Buffalo Bills will open training camp for the 2018 NFL Season. As with most training camps there will be important positional battles and the team will be looking for some young players to develop. The team, fans and media will also be looking for the answers to some questions they have for 2018. With this team, it looks as if most of the questions are centered around the offense. 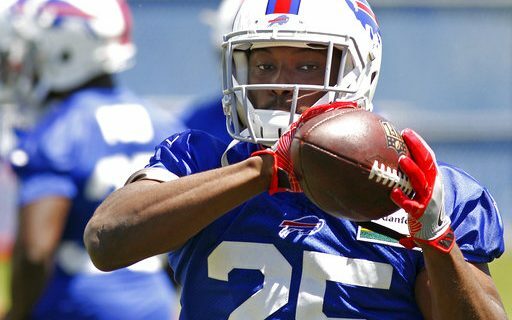 The first question that has to be answered will be if LeSean McCoy will be available to play for the Bills this season. Since accusations on a home invasion and domestic abuse serviced a few weeks ago, neither the Bills, McCoy nor the NFL has said much. Until the police in suburban Atlanta complete their investigation I don’t think much else will be said. Still the Bills have to prepare for life without McCoy. If that is the case, the lead back at this time will be free agent signee Chris Ivory. After him there is a bunch of question marks, as no one has really shown that they are capable NFL running backs. The Bills could also explore the street free agent department but there isn’t much their either. The top names are C.J. Anderson, Brandon Oliver, Darren Sproles and Adrian Peterson. Needless to say, if the Bills don’t have McCoy they are in trouble right away. On the offensive side of the ball, other key question battles will revolve around the offensive line and the wide receiver position. At wide receiver, the biggest question is who will be the starter opposite Kelvin Benjamin? The Bills drafted Zay Jones last year to be that player. Jones rookie year was less than expected and then he had an off-field issue following the season that is concerning. Add to that a minor surgery and the jury is out on Zay until he proves otherwise. Jeremy Kerley was signed as a free agent, but he is the guy slated for the slot receiver position. That means that if Jones isn’t ready to go the other outside receiver position will come from the group of Andre Holmes, Rod Streater and Brandon Reilly. It’s hardly a group that would instill fear in an opposing defense. How the wide receiver group plays as a whole has to be one of the most important questions for the Bills to answer in camp. If it isn’t the wide receiver group, it’s the offensive line. The Bills lost two key starters in center Eric Wood and guard Richie Incognito. Those are big shoes to fill. Going into camp it looks like either Ryan Groy or free agent Russell Bodine will be the starter. At guard the Bills hope that fourth year vet John Miller returns to the form he showed early in his career. Obviously the last question to be answered on offense is who will be the quarterback? Yes, the Bills drafted Josh Allen with the seventh overall pick in the first round. But the reality is, if he has to play the Bills are in trouble in 2018. The Bills got a taste of the playoffs last year and they would like that to continue in 2018. For that to happen either second year man Nate Peterman or free agent A.J. McCarron has to take control. Coming out of the offseason program, it seemed as if Peterman had a slight edge but remember, OTA’s are not live football. Now with the pads on things could change. On defense, he question on the defensive line is…will Shaq Lawson play up to first round draft choice play up to first round draft choice form? To date he hasn’t and with this being his third season, it’s time to take control. At tackle, free agent Star Lotulelei and rookie Harrison Phillips allow the Bill to play a three man rotation with returnee Kyle Williams. They may even have a strong fourth tackle in either Tenny Palepoi or Adolphus Washington. For that to happen one of those two has to emerge as a strong player in camp. At linebacker, the Bills used a first round draft pick on Tremaine Edmunds to be the Mike LB. In McDermott’s scheme the Mike is the most important linebacker and he has to be fast and instinctive. How quickly Edmunds develops will be key to the Bills defense this year. The secondary will have one new starter in corner Vontae Davis. He replaces E.J. Gaines who left during free agency. As good as Gaines played last year, Davis has more size, speed and athleticism and he should help upgrade the unit. The Bills also have to find a nickel corner and it could very well be rookie Taron Johnson. If he develops as expected a good Bills secondary becomes better. #9: Will Beane Make A Move?